The 'Official' National Trail Guides 4th stage of the North Downs Way goes from Merstham to Oxted but at only 8 miles it is a little short for a good day walk. This has probably arisen out of necessity for links with railway stations and accommodation, as we were not really depending on either of these and felt that we could start to build up our mileages now that the days were getting longer we looked into the possibility of combining 2 stages which would take us up to the next accessible railway station. This would have been nearly 20 miles and a little too far at the moment, so we decided to walk out as far as we could from Merstham for 3 hours and then go back intending to cover about 16 miles. It all looked ok on paper, and after 2 and a bit hours we found ourselves approaching the Oxted Downs. We took one look at the steps heading down from the escarpment towards the railway tunnel and all of a sudden the thought of having to walk down them only to walk straight back up again made us think that we should turn back whilst we were still on top of the hill. We also thought, for reasons that will be explained once we have completed the whole walk, that we would probably see these steps again over time from the top and the bottom, so they could easily wait for another day. So, for now we have stage 4 and 3/4 Merstham to the Oxted steps. A stage that I thought was searching for an identity of it's own and didn't really manage to achieve anything other than being a link between two main centres of civilisation. Perhaps this was more out of the fact that we weren't aiming to get anywhere. Shortly after leaving Merstham train station we headed up towards the M25/M23 to join up with the North Downs Way, then uphill through a sticky ploughed up field and along a nice country lane where we were greeted with the welcome of the day 'You are going to get a bit muddy today, it's like a paddy field further up!' Even now the voices inside my head were reminding me about the gaiters that we had left behind at home. That of course was after our customary getting lost phase, the signpost on entering the field had been ripped out and with the field ploughed it was difficult to see any path, so out of courtesy to the landowner we walked around the edge of the field only to realise that we were going away form our objective. So back to the ripped up post and careful examination of the ground, at last we noticed a line up through the ploughed field, confirmed by a lady walking down with her dogs, cue second best greeting of the day ' be careful you'll get blown off the top up there'. Well we weren't blown off the top but we did find the paddy fields, luckily the mud was over made up road so not deep but very slimy and we were able to probe mud depth levels with our trekking poles and arrived at Willey Park Farm from where the views towards London were simply amazing. It is surprising that the guide book we are using mentions nothing at all about the view from here and only refers to the London skyline being visible from a point further along the way. I suppose in some ways that is the stages identity to the North there are amazing views of probably the busiest city in the world then to the South separated by one of the busiest motorways in the World you have wonderful countryside. Not exactly dramatic mountain scenery but the juxtaposition was breathtaking, we just kept stopping, taking in the view and looking for our house! Neither of us really had any idea that it would be possible to see London from here yet there it was lying in the Thames valley, the Gherkin, Docklands, Crystal Palace and even, as we noticed on the way back, Wembley Stadium, well the arty ring above it, the stadium still not being completed in time for this or next year's events! It must be an amazing sight on a clear night with the Capital lit up below, also it made us think of the wartime stories of people watching London burning. From this vantage point it is easy to see what it must have been like. 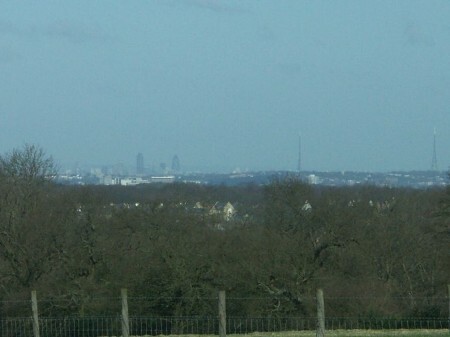 Most of the way runs next to the M25 and the noise is never far away, it is surprising however to find how good the views across the motorway towards the South Downs are and there are several view points with benches along the way. For once we took our time and sat in the sun watching the world speed by below. February and we were sunning ourselves, normally we have to go to the French Riviera for that! In retrospect we probably could have gone down the Oxted steps and back up. We covered 14 miles and felt that we could have gone on a little longer, there was at least another hour's sunlight but at the time it was one of those mind things. I am not going down there only to climb back up again! In the end the way back - that is the opposite way to the official direction - seemed to be far more enjoyable than the way out. My only personal disappointment - this week I had done some research, read the book and discovered that the forts mentioned along the way (we completely missed Reigate, although we were standing next to the entrance) were part of an early defence system for London known as Palmerston Forts. Parliament debated for decades about how to defend London and then in the 19th Century with the pesky French again up to no good decided to build a series of fortifications around the North Downs, the Pilgrim Fort shown on the route today was part of the system, unfortunately unlike Reigate Fort you can't see it from the path!